Peter Portante has been driving in competition since age four. As a driver Peter has the nickname 'B' but also Peter Importante. Peter drives for The Atlanta Motorsports Group (AMG) in Georgia and races in the Mazda MX-5 Cup Series. 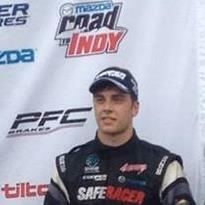 Peter is active in both oval and road track competition and also coaches other young drivers. He is a wonderful speaker and brings great personality and humor to any event. Inside the race car he is highly competitive and has now won several Championships and many, many races. Between 2012 and 2013 Peter began competition in the Mazda Road to INDY program driving in Formula Continental and USF2000 Series events throughout the USA and Canada. At the half-way point in the season he is 7th in points and leds all 'Rookie Drivers in the Mazda MX-5 Cup. Peter’s goal is to race in Pro-Mazda and selected Indy Car Championship events in 2017.